The Blue Devils still hold the top spot after the first day of the DCI Eastern Classic in Allentown, Pa. with a strong score of 95.80. The second-place Cavaliers (94.25) have closed the gap slightly and are now about a point and a half behind the undefeated leaders. "I thought the show tonight was incredible," said Blue Devils tuba player Tim Leonelli, a member of the corps since 2007. "I was a little nervous at first because Allentown is a big event. Almost every Blue Devils corps has gone through this stadium, so I want to leave a good mark. And I thought the crowd was just great." It's a position the Green Machine has found itself in before. 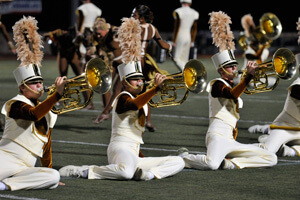 As the season winds down to the last seven days of the 2010 DCI Tour, some diehard Cavaliers fans may be thinking back to 1995 when the corps reversed a 1.1 Blue Devils advantage from just a week earlier to finish 1.6 points ahead to claim their second World Championship. "Having marched 2008, when Phantom Regiment slipped by us at the end, I've learned anything can happen, but I'm not really too concerned," Leonelli said. "I'm heading into [Finals week] with a smile on my face … Target on my back or not, I'll be relaxed." In third place, Carolina Crown (93.45) stayed consistent in score as the corps cleans up its new finale, a reprise of the end of its 2009 program, "The Grass is Always Greener." Executive Director Jim Coates said the corps locked it in during Friday's performance and inspired the right crowd responses at the right times. "We feel as if we put together a challenging program from a design standpoint for the members in 2010, and they're really living up to it," Coates said. "It's the most challenging program we've ever had, but that's by design that we wanted to do that. They're living up to the performance levels of it. It's taking a little bit longer than we thought may happen for performance, but we still have another seven days to go." The Blue Stars (4th, 90.35) recently beat their 2009 high score, with a week left to go in the season to go even higher. Their program, "Houdini," makes creative use of straightjackets, decorated flats, and boxes resembling the elaborate traps the famous magician always managed to elude.